Mystical Faction: Which are the best books to read first? Which of Etienne de L'Amour and H.M Forester's novels are best read first? MAY 2017 UPDATE: You can download copies of ALL the books from here on our web site. Although marked as "review copies", there are no strings attached, so just enjoy! 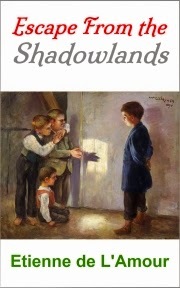 The best book to begin reading is Escape From the Shadowlands or the next book, In Search of Destiny. Although they are preceded by two prequels, they stand on their own and are pretty much self-contained. (a) Escape From the Shadowlands by Etienne de L'Amour is a soft scifi / mystical adventure ebook available for the Kindle at just $2.99 (or the nearest permitted equivalent outside the US). ☆☆☆☆☆ "Astounding, dizzying journey! Entertaining, enlightening." If you like Doris Lessing's Shikasta; James Hilton's Lost Horizon; the writer, thinker and Sufi teacher Idries Shah, or the legendary Sarmoun Brotherhood, then give this book a try. (b) In Search of Destiny is set in the disparate realms of the Outlands; Sher Point, the metropolis of the so-called Freelands, and the mystical kingdom of Narayana in the East. It tells the story of Conrad Harper, who sets out one day to search for his destiny and heart's true desire; of the help offered him by a mysterious organization known simply as the Network; his journeys with the Master of the Tradition, Tenzing Jangbu Rinchen, and of his finding romance and ancient knowledge. And it shows how ordinary and everyday experiences, which we tend to take for granted and often do not value, can be brought into service and woven together into a rich tapestry with an altogether higher purpose. 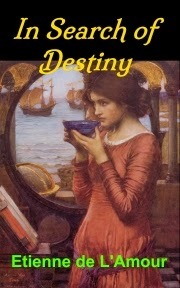 Although In Search of Destiny is book 4 in the Shadowlands series, feel free to read this first. Game of Aeons: A short novel by H.M. Forester stands on their own and is self-contained, so that's as good a book as any to read first. Game of Aeons is a soft scifi / virtual reality, available as an ebook for the Kindle at just $2.99 (or the nearest permitted equivalent outside the US). When do games become reality? 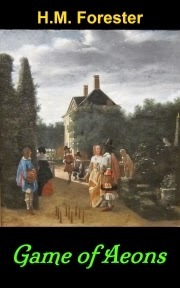 Or is "reality" a game? Thanks so much for your kind ratings and reviews at Amazon and Goodreads. Short reviews of just a couple of sentences are much appreciated! Or if you're into ESP and other faculties, you might like to try "The Gift" first.